I recently did an inteview with Bob Zukis of Digital Directors Network. DDN works to put a digital director into every boardroom and to make every director a digital director. JOHN ROSSMAN: Current and former board experience: Former Amazon executive and board advisor to Supply Clinic, FaceCake Technologies, Modjoul, Decisiv and Terbine. 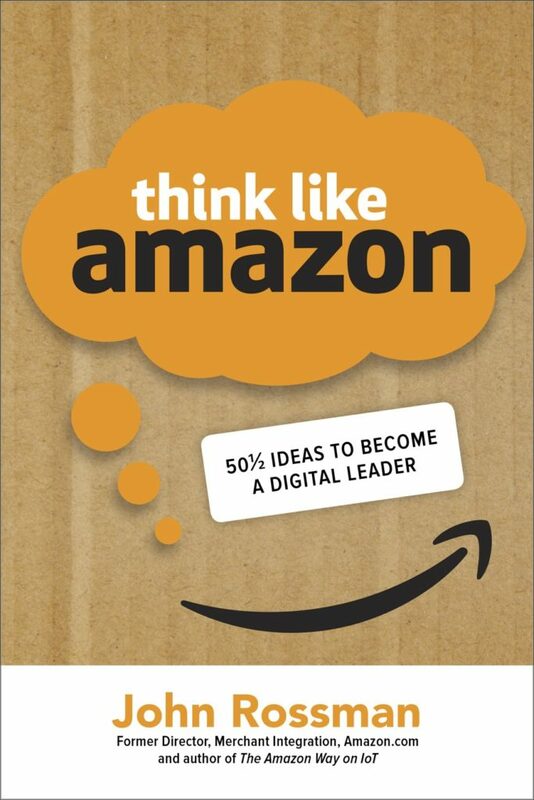 John’s the author of several books on Amazon and shares his insights ahead of the release of his next book Think Like Amazon: 50½ Ideas to Become a Digital Leader (McGraw-Hill). DDN: “The Amazon Effect” is something that’s been talked about since Amazon upended book retailing, what is it to you? Rossman: “The Amazon Effect” is about being willing to invent and reinvent the customer experience by leveraging digital technologies and new business models. It’s about rethinking a business to its core value added activities and having a willingness to compete in a different way. It started in books, but they’ve applied it to many retail categories and other industries, such as computing infrastructure and logistics. DDN: Does “The Amazon Effect” exist without their use and deep understanding of information technologies? Rossman: No. They use technologies to completely rethink and re-engineer internal processes to connect an ecosystem together to provide a unique customer experience. But it goes way beyond the technology also. It really is rethinking business models and being willing to compete on price and rethink margins. Through the lens of customer value understand it’s the lifetime value we’re optimizing, not a specific order, item or for a specific quarter. The willingness to make investments over a longer period of time is key and core to The Amazon Effect. DDN: As a board advisor how do you start this conversation? Is this a strategic discussion, risk discussion or something else? Rossman: Strategy and risk are two sides of the same coin. It’s strategic in that you need to be deliberate in what paths you say yes to, and what you say no to, and it’s also strategic because you decide to either open up new ways of competing and change where resources will go along with what you’re going to say no to. It’s risk based because risk is really dependent upon what time frame you’re evaluating. Over a short period of time, risk may be completely opposite of longer-term risks. For example, a short-term risk might be if I decide I’m going to compete with an existing channel or channel partner by opening up a direct to customer or new avenue for sales. Over a short period of time, that may be considered a high-risk item to do, over a longer period of time not doing that might be the risky thing to do. That’s part of the challenge for boards; optimizing or reducing risk over the short or long term. Amazon has clearly said and demonstrated they see things over a longer period of time; ten to twenty years. Because of that longer period of time they are willing to do different things; they think the biggest risk in the enterprise is not challenging your existing business and not being willing to “eat your young” to reinvest in your future. I think that’s the biggest challenge for boards. DDN: Who needs to lead this conversation on the board? Rossman: The CEO needs to be leading this conversation. If there’s a boardroom digital leader or technology committee it can be an advantageous way of making the conversation more formal. You could put the responsibility in a risk committee; I don’t think there’s a wrong answer to who owns it at the board level, the most important thing is that these questions are being asked and understood and that’s there’s the curiosity to go on a learning journey and to think through how these issues might apply. For example, a topic like machine learning, in many companies you go “We have no idea how that might apply, and we see no threat or advantage today.” You don’t want to be in a position where all of a sudden somebody has invested, somebody has figured it out and the threat is suddenly there. You have to start the educational process early and challenge yourself to how these issues might apply. Too often these conversations are done in a moment of fear and reaction, and then you’re not playing from a position of strength. DDN: Do you think that element of boardroom curiosity has to have structure? Rossman: It has to have structure and its best done if it’s done as a group. One of Amazon’s leadership principles is about actively working to disconfirm your biases and beliefs. That’s a completely different way to approaching leadership education, “how do I actively disconfirm my biases and beliefs” and that helps them avoid blind spots. It does need to have a structure and agenda to it, so the board is learning together and you’re putting forward appropriate and provocative questions to consider. DDNL For a company that doesn’t have Amazon’s technology backbone and legacy, how do you begin to think and perform like Amazon? Where do you begin? Rossman: That’s the rationalization to why you want to start early so you are building organizational capacity. You can compensate for that in lots of ways; partnerships, acquisitions, targeted hiring. This notion of IT owning “becoming digital” is an antiquated notion. So much of what we’re talking about is “how do we push technology to the edge, how do we infuse it into all of our products and our services.” IT alone cannot meet the need of doing that. All of the business leaders need to have a point of view on how better data can help; and that’s why you have IT, to have data. It’s really about what data, events and understanding you need to have from your product, services, distribution and supply chain to be a better business partner to our IT organization. DDN: If a board or leadership team isn’t owning or driving this issue do you think an organization has a lesser chance of succeeding? Rossman: Over the short term — maybe, maybe not. Over the long term, yes. The only twist I would say is everyone defines digital in a different way. To me, becoming digital is about always challenging the status quo and always raising the bar on being a world class operator. It’s not just about innovation, it’s about “how do we continue to become a better operator in pursuit of perfection.” Amazon gets a lot of press for their disruption and innovation, what they don’t always get a lot of press for is the fact that they are a world class operator. They were voted the #1 supply chain company by their peers. Many of their innovative ideas come from focusing on their metrics and focusing on how they get to perfection in meeting customer expectations, improving quality, lowering cost, improving safety. That essence of innovation comes from walking around and solving today’s business problems. DDN: How much of Amazon’s success comes from the one big thing or sweating the details? Rossman: It’s like an Oreo cookie. You can’t say it’s the cream, or the chocolate cookie, it’s the combination of the two that make it an incredible cookie. It’s the same at Amazon. The outer shell is their leadership principles and belief that “we are inventors, we are explorers” and we’re going to use incredible technology and data to rethink industries and the customer experience. The inside cream is the pursuit of operational everyday excellence and it’s the combination of those two things. You can’t have one without the other. 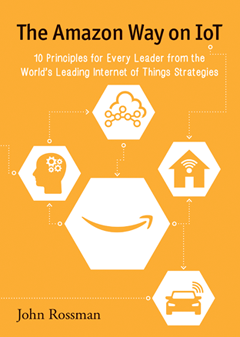 John’s upcoming book Think Like Amazon: 50½ Ideas to Become a Digital Leader can be pre-ordered on, of course, Amazon.